What happens when you mix an arc welder, an eight-year old boy, and a handy grandfather? 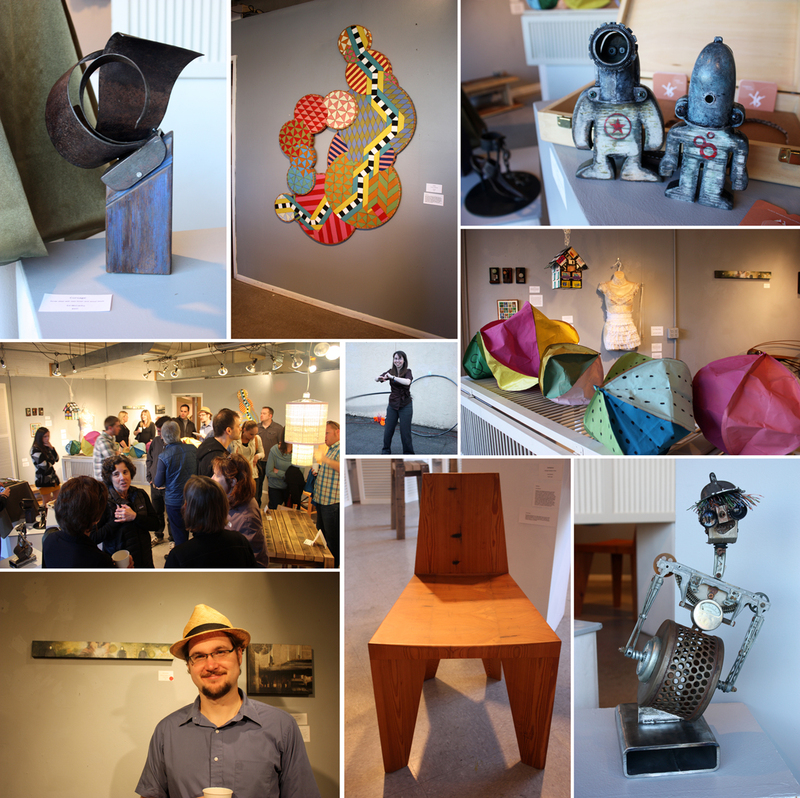 You found out if you visited Bellingham’s Allied Arts gallery in April, one of four galleries in The RE Store’s 11th Annual Recycled Arts Show. 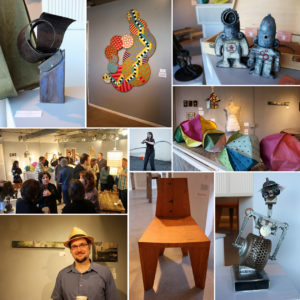 This year’s multi-city exhibition attracted professional and semi-professional submissions from a talented pool of regional artists, designers, makers along with a unique entry from Culver Bontrager. 2012 Bellingham Recycled Arts Show Galleries at Allied Arts and The RE Store. Culver (in red) at top center. Click to enlarge. Culver and his grandfather now make the rounds of scrap and junk yards in Everett and Lynnwood, looking for old car and farm equipment parts for Culver’s projects. Culver is an avid lego fan and technical little guy. “He is very detailed in building things and great at sticking with the details. His attention span is longer than most kids his age,” says his mother, Melana Bontrager, who has shown her own artwork in galleries around the greater Puget Sound region. The young welder was excited about the possibility of selling Mr. Bones. He has other family members besides his mother who have shown in galleries before so he has had exposure to the world of selling art in galleries. Culver unfortunately could not be reached for comments, due to a busy schedule building lego creations with a couple buddies. 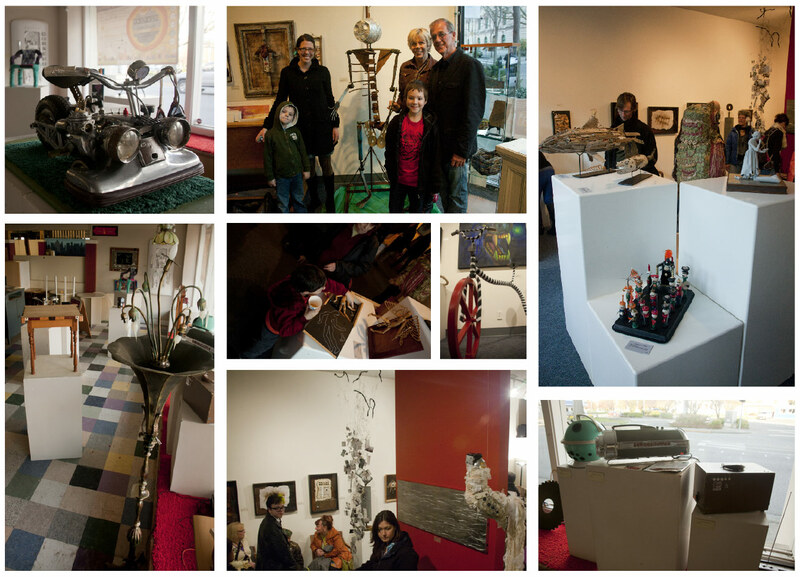 See more about the Recycled Arts Show on The RE Store’s page, including reviews, events and years worth of recycled art photo galleries. This year’s galleries included Seattle’s Blowing Sands Glass Studio, Allied Arts of Whatcom County, Whatcom Museum and The RE Store in Bellingham. The Blowing Sands exhibit is up until May 9th. If you subscribe to our email newsletter we keep you in the loop about upcoming workshops, recycled arts happenings, calls for art or designs, DIY videos and more.